So I am back with another shopping experience post/review and this, by far is the craziest experience of all. So today I am going to share my shopping experience at *drumrolls* KYLIE COSMETICS!! Yup you heard it right. I seriously have to pinch myself to believe that I actually have the box of my dreams with lipstick drips and wearing one of the most coveted shades while I am writing this. I might sound too dramatic but I literally have reasons to be this excited and I'll tell you everything. So let's start from the beginning. So if we go back to last December, you pretty well know what happened. While everyone was enjoying Christmas Holidays I was busy giving my final exams. It went on for a month and both my Christmas and New Year were ruined. So naturally I had to shop, a lot, and along with other things I decided to splurge my money on Kylie Cosmetics. Come on, I totally deserved it. So on the 21st of December I placed my first ever order on Kylie Cosmetics. And as soon as I got a mail from Kylie Cosmetics that the order has been placed successfully, I took to all my social media accounts to announce it. I literally called up all my friends to tell them I am finally getting my own lip kits. And they were so jealous. Placing the order is pretty simple (well unless it's a new launch or restocking..You really need to be very lucky in these cases). Choose the products you want to buy. Free shipping over $40 for domestic orders and over $60 for international order. Otherwise the shipping charge is $14.95. I anyway wanted to buy a lot of stuff so I didn't worry about shipping charges. You can only pay by card. There's no other option there. But the best thing is they ship to any part of the world so if you really want your hands on Kylie Cosmetics then you can get them without any hassle. I mean I wanted to shop from so many American brands before but most of them don't ship to other parts of the world. Okay..I have sooo much to say here. They post by USPS. Initially when I placed my order, the tracking was getting updated very quickly. I was really excited and I was definitely expecting my box within 15 days. But the tracking suddenly stopped and it remained like that for days. I freaked out so much. I had my exams going on and instead of praying for a good paper, I was praying I get my lip kits. But a month went by and there was nothing. I totally lost hope and eventually forgot about it. So the day before yesterday that is, on the 21st of February I was attending my classes when my mother was repeatedly calling me. I texted her I am in class and she still called me. I got scared if something happened to someone. I got down under my desk and answered her call. And from the other side, my mother was literally yelling at me. "What did you order again of Rs.2300? ", She sounded really angry. I thought for a moment and told her I haven't ordered anything. So she was like It's some cosmetics, it has to be you. "I swear mum...wait what did you just say? ", And before she could reply back I was literally begging her, "Mum listen carefully you need to take it, It's custom for an international order. It's Kylie Cosmetics. Mum are you listening to me?". I was so anxious. Finally She paid the custom and phew, I got my lippies. So basically I placed an order of $93 which is about Rs. 6500 and Rs. 2300 extra for the customs and it took exactly 2 months to reach me. 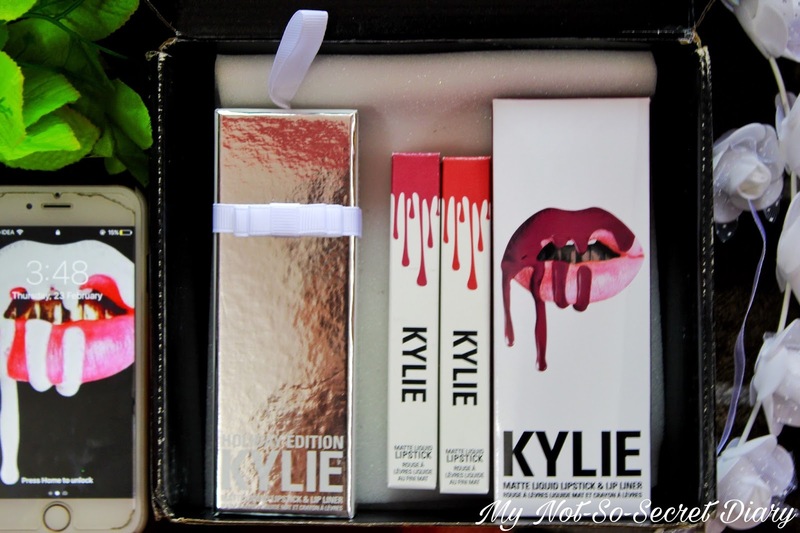 As I mentioned, it came in the famous black box with white lipstick drips inside and Kylie written on it. It had a hand written (printed) letter inside and the products were in perfect condition. It's one the prettiest packages I have received for sure. I hope you found this post useful, specially the people who want to buy Kylie Cosmetics but are still confused. I hope I have answered all your queries in the post. Also, a lot of people asked me where did I place my order or where can we buy Kylie Cosmetics, well you can only buy the Authentic products at kyliecosmetics.com or there are two pop up stores but that's in the USA. So for online shopping, it's just their website. Any more queries, feel free to ask me. Hey, I was charged Rs.2300 for a package of $93. So although it was supposed to be a free delivery (i mean above 60$), it still cost u more 2300₹ ? I too ordered a package from Kylie Cosmetics and it has been 15 days since i have ordered, the tracking shows it has reached Delhi and it has been stuck there since 10 days. I'm scared too that maybe I need ot go and pick it up from somewhere, so just needed to know, do I need to enquire the post office about it or should I leave it and they will themselves take their own time and deliver it to me. Look it took 2 months to reach me. So they usually take quite long. I would suggest you wait for at least 10 days more. But I can totally understand what you are feeling. You can mail their customer care. They are helpful people and you can call up the post office too if this is bothering you a lot. Usually because of the custom and everything they take so long. So don't worry. I hope it helps. Yeah, maybe I'll wait another 10 days like you suggested and then call up the post office. 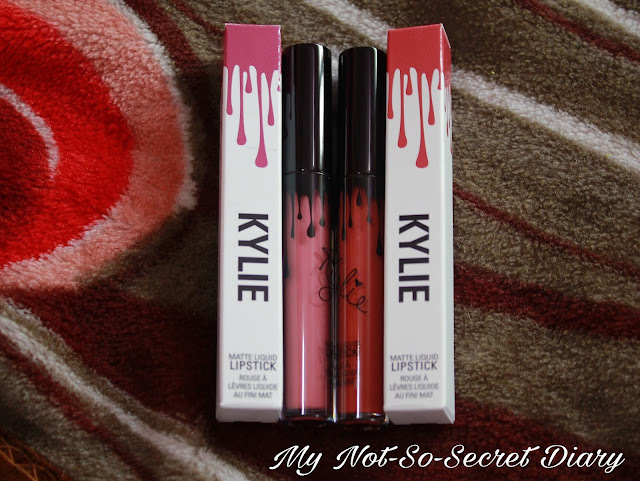 I did ask the Kylie Customer Care executives and they told me that I need to ask in Indian postal services since it has already reached here. If it's still taking time you just write to the customer care again. They sometimes offer to resend or refund in case the package doesn't reach you. Hi gal, it was quite an information you cleared all the doubts. Thanks for taking time n posting to help others. Keep posting!!! I had placed order on kylie in mid of February month. And still there is nothing as tracking doesn't show anything. Should i just go for refund or wait for another week or two. It took 2 months to reach me..so I think you can wait if you want to. Hi, I placed my order through Shipoutfromusa and I got my lip kits within 15 days from date of order. The customs also was not very high. And the team helped me out with every query of mine. Check out this website www.sofu.us.